Another example of an iMac used in an office, with great effect. Last time it was a G4 (my favorite). This time, either a G5 or an early Intel iMac. 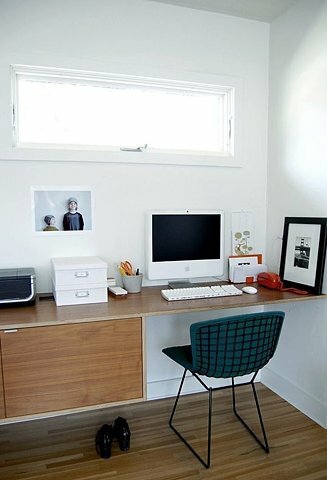 The workspace, from Apartment Therapy, is an example of a “floating desk” design for cramped offices. I like how the iMac’s screen seems to float in mid-air, too, with the white body of the iMac blending into the wall behind it. Which makes me wonder: will we see computer screens hung on a wall, like high-def TVs are now? Would you run the cords through the wall, so it appeared to float? I’d love to see one. Posted by davelawrence8 at 6:08 am on January 20th, 2009. 2 comments... » Categories: macs. Tags: apple, float, G5, imac, mac, office, simple. Subscribe via RSS.